Home » Retirement Planning » What Is A SEP IRA? A Simplified Employee Pension, or SEP IRA, is an individual retirement account for the self-employed or small business owners with companies that are too small to qualify for other IRAs. There is no tax on contributions, and monies in the IRA go untaxed until withdrawn. 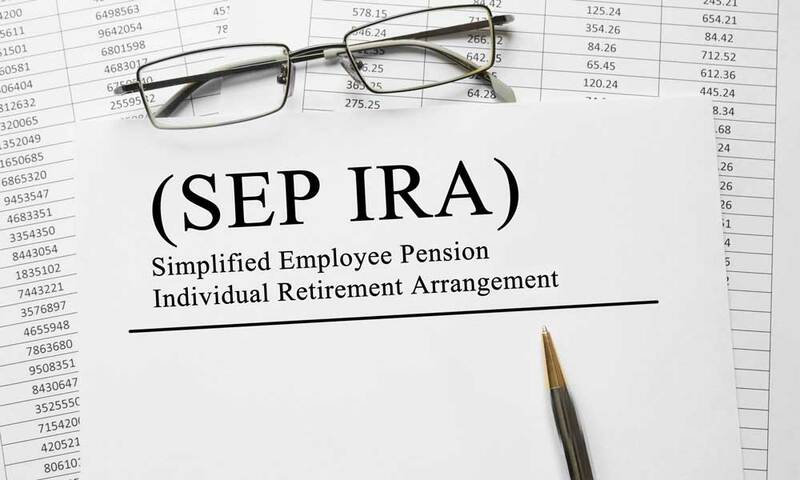 However, employees cannot contribute directly to SEP IRAs; contributions are made only by the company (or self-employed individual) and held in the employee’s name. According to the IRS, SEP IRAs are subject to the same investment, distribution, and rollover rules as traditional IRAs. Generous Contribution Limits: SEP IRAs have very high contribution limits that may be attractive to small business owners and self-employed individuals. While SEP IRAs provide for employer contributions towards an employee retirement, the high contribution limits are most beneficial to employers saving for themselves and the tax deduction that comes from that high contribution. Limits for a SEP IRA in 2018 are the lesser of 25 percent of compensation or $55,000 noting that contributions must be cash and not property. Equal Contribution Rate: While the high contribution rates are appealing to business owners, it is not an unequal windfall. If a small business owner provides a SEP IRA to employees, contributions must be at the same rate for all. Therefore, a small business owner cannot contribute 25 percent of their compensation to their account but only 5 percent of the employee’s wages to the employee’s account. The rates must be equal. Investments In Other Plans: The employer contribution to the SEP does not lower a personal contribution limit to other traditional or Roth IRAs. The SEP IRA works in addition to other IRAs in a person’s portfolio without a penalty for the employer contribution account. IRA Owner Investment Choices: While employers fund SEP IRAs, the IRA owner makes the investment decisions from select offerings from the IRA manager. This practice reduces complications for the employer and increases employee freedom to manage their IRA in a way that is comfortable to them. 100 Percent Vesting: Employees are 100 percent vested from day one in a SEP IRA. Complete vesting is an attractive feature for employees but may be disadvantageous to small business owners. The trade-off is losing the incentive that may keep employees longer while instead offering an enticing item in the benefits package at hire. Can I Keep My SEP IRA If I Change My Job? Very few workers stay with the same employer for their entire career so knowing what happens to your retirement accounts is vital. For a SEP IRA, employees changing jobs have several options. SEP IRAs can be rolled over or transferred into another SEP IRA or other retirement accounts such as a Roth IRA or 401(k). If transferring to a Roth, you should be aware of tax implications as a Roth is not tax deductible up front. Another option is to keep your SEP IRA and just let it grow based on the contributions already made to the plan. The custodian of the IRA determines if you may be able to keep it at the same financial institution or need to transfer it to a new institution of your choice. What If I Close My Business Or Am No Longer Self-Employed? Business contributions or contributions from the self-employed individual fund SEP IRAs, so you can no longer contribute to your SEP IRA if your status as self-employed or business owner changes. If you close your business or return to a traditional employee role, you would have the same options of how to handle your SEP IRA as if you were a company employee who changed jobs. When Can I Withdraw SEP IRA Money? SEP IRAs allow withdrawals to begin at 59½ without tax penalty. Before 59½ there is a 10 percent early distribution tax penalty unless the withdrawal is a qualified early withdrawal. Whether or not you are still working, when you reach age 70½ you will have to begin taking a required minimum distribution(RMD). Required minimum distribution amounts will vary based on your circumstances, so if you have been taking out only small distributions from your SEP IRA, the RMD may be higher than what you had previously been withdrawing. While you cannot take a loan from a SEP IRA, there are some instances where you can withdraw money from the SEP IRA before reaching 59 ½ without incurring tax penalties. The following general situations are examples in which you may be able to take early withdrawals without penalties. A SEP IRA is an effective way for self-employed individuals and small business owners to provide for retirement. However, because it is an IRA with only contributions from the business, it takes much of the control out of the hands of the employees. On the employer side, the disadvantage comes from the 100 percent vested from day one feature which may affect employee loyalty. What Is A Roth IRA? What Is A SEP IRA? What Is A Gold IRA Rollover? How Do I Open An IRA?